Home > Our Blogs > Learn+Teach+Share > What is an Ally? When I think of what it means to be an ally, I think of a protest I attended in 1994. I was marching along with countless other Latinos carrying flags from Mexico, El Salvador, and other Latin American countries. When I looked more closely at the crowd, I noticed that there were also whites, Asian Americans, and African Americans in the mass of people moving down Cesar E. Chavez Boulevard. The crowd moved peacefully, almost gracefully, as the sun beat down overhead. We wore t-shirts and jeans, hats, and sunglasses to guard against the sun’s glare. It was a Sunday and, depending on who you talked to, there were between 60,000 and 100,000 people on the streets that day. Pete Wilson, the Governor of California at the time, was one of the strongest proponents of Prop. 187. The argument in favor of Prop 187 was that it was unfair for people living in the state illegally to be provided services while services were being cut for others living in the state legally. Backers of Prop. 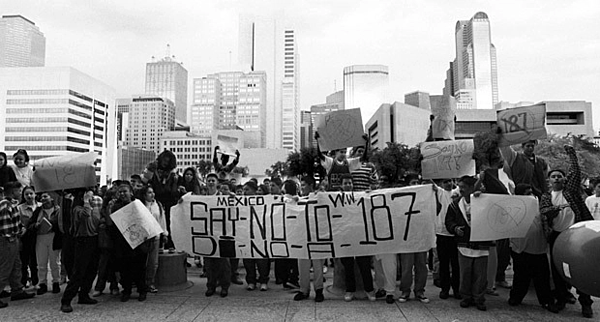 187 also claimed that those who demonstrated against and opposed 187 were a small minority of Californians. This fostered a feeling that there was a majority of Californians that didn’t want to have to “pay” for immigrants to the tune of $200 million per year. The ballot initiative was actually titled “Save our State,” which echoed many of the racist slogans and attitudes from the time before California was a state of the Union. The message was that if you were Latino, you were unwelcome. Looking at the crowd, I felt a sense of elation because so many people turned out to support the Latino community. Even if those tens of thousands of people were a small percentage of Californians, I didn’t care. I remember looking at the faces of the non-Latinos that day. I took it to heart that they were all there. So much of the media coverage and the outrage against immigrants at that time was anti-Latino immigrant. 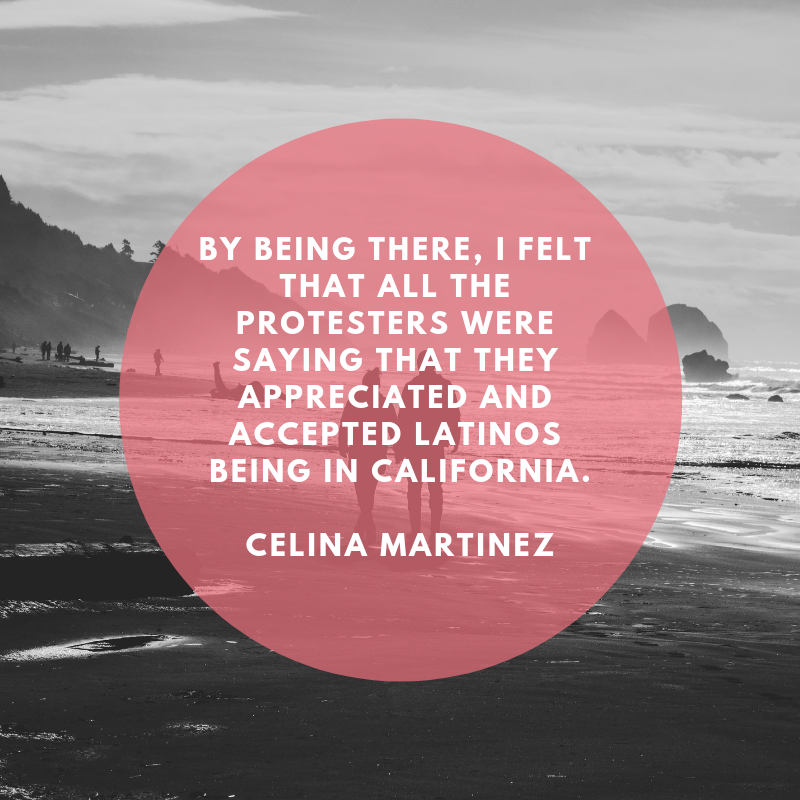 By being there, I felt that all the protesters were saying that they appreciated and accepted Latinos being in California. Even though I was born in the United States, I had immigrant parents and I knew how difficult it is to grow up in Los Angeles being poor, even with public education and health benefits. I learned Mexican-American history for the first time when I attended Stanford University. I wrote about the cyclical deportation of Mexican immigrants and citizens from the United States over and over again in the course of my studies in college. It was a fact that I felt was kept from me, but, at the same time, made all the sense in the world based on how I was treated in school. I learned that the term “affirmative action” was highly charged and was supposed to explain how I got to Stanford University. I learned that my grandfather was a bracero, a guest worker from Mexico in the 1940’s and 1950’s. I learned from my mother the names of the American cities where her father worked in the fields when she was a girl. Despite being born in the U.S., I felt profoundly affected by the rhetoric of the anti-immigrant campaign. I felt that my community was targeted and that it could easily also happen to the others who stood in solidarity with Latinos that day. As I looked around at the faces of the other protestors, I wondered what their stories were; I wondered if they also had histories that made them feel unwanted. I decided that my work as an ally to other communities would include learning their histories. As a part of Facing History and Ourselves, I have learned in-depth about Jewish, Armenian, African-American and Asian-American history. To me, being an ally means knowing that if it’s not Latinos, it can be the Chinese, Japanese, or Muslims, and if it’s not in the United States, it can take place anywhere. As an educator, I wonder how teachers in the Facing History community introduce these histories to their students. How do you get students to think and write about their own experiences? Below are some suggested prompts to get students thinking about what it means to them to be an ally. Please add your own suggestions in the comment box below, as well as any tips on how you have introduced these topics with your students. Speaking from your own experience, what does the word ally mean to you? What images does it evoke for you? Who are the targeted groups in your community? What actions have you taken to be an ally to a targeted group in your own community? What does being an Upstander mean to you? Does your identity play a role in how you think about being an ally and an Upstander? If so, how? This is part of our spring series on Upstanders. Want to read more? Celina is a Facing History Program Associate in the Los Angeles office. Her work in education includes roles as a Reading Specialist at Mother of Sorrows Catholic School in Los Angeles as well as a Middle School Language Teacher at P.S. 89, Cypress Hills Community School, a dual language K-8 public community school in New York City. She taught 7th grade English, Spanish Humanities and Special Education and was also responsible for curriculum design and planning. Over the years, she has also held freelance and short-term roles in curriculum writing and content development as well as summer teaching positions and adjunct positions in higher ed.